﻿ Are M&A Deal-Making Skills Value-Creating Skills? Are M&A Deal-Making Skills Value-Creating Skills? Is M&A a viable value creation strategy? Last year, The Boston Consulting Group's 2015 M&A report looked into whether frequent acquirers grow faster and create more value for their shareholders. The 2014 report examined the importance of divestitures to creating value. Corporate leaders today are wise to consider options on both sides of the M&A board. And more often than not, buy-side and sell-side decisions are closely intertwined, as in when companies need to free up cash to buy a promising prospect or antitrust authorities require the sale of certain assets as part and parcel of a major acquisition. This year, we used our proprietary database of more than 54,000 M&A transactions since 1990 to assess whether companies can employ their deal-making skills on both sides of the transaction as a strategic tool for value creation, and if so, what sets these companies apart from other corporate buyers and sellers. Portfolio masters are serial dealmakers such as GE, Accor, and Cisco; they use M&A as an instrument to routinely rebalance their portfolio of businesses, and many do so with frequency. In quantitative terms, we define portfolio masters as companies that execute at least five major transactions (buying or selling) over a five-year period. For example, within the past five years (from 2011 through 2015), GE bought 19 major businesses and sold more than 50 major assets, such as its $32 billion sale of NBC Universal to Comcast.1 (GE’s total deal count for the period exceeds 300 when smaller deals and minority stakes are included.) Cisco acquired 17 companies while divesting its television set-top box business in 2015 to Technicolor. Portfolio masters are a rare but prolific breed. Taking the full 25 years of transactions in our database into account, we can identify 1,339 companies in this category, representing only 6% of the companies in our sample. Yet these companies accounted for almost 14,000 deals, or about 25% of global M&A over the past 25 years, and an even higher share of total transaction volume (37%). They are responsible for many of the largest deals ever done and have an average transaction size of $933 million. Strategic shifters are companies that frequently rebalance their portfolios through M&A; they are involved in two to four transactions over a five-year period. They make up approximately one-quarter of companies in our sample (6,354) and include such names as Mattel, Texas Instruments, and K+S. This category was responsible for the largest share of transactions—about 22,000 deals worth close to $13 trillion, or 40% of the total. These companies tend to have significant M&A experience but do not use deal making consistently as a primary tool for shaping their portfolios. The largest group of companies by number (roughly two-thirds of the sample) are one-timers—more than 11 times as many companies as there are in the portfolio master category. Some 15,000 companies have made only one acquisition or divestiture each over a five-year time window. Yet, with a combined count of 18,891 deals since 1991, they represent 35% of total M&A deals globally. One immediate conclusion: for the typical CEO, M&A is a once-in-a-lifetime activity; most companies prefer to pursue organic growth. As we shall see, this bias may work to their shareholders’ detriment. We have included only deals valued at more than $25 million with the acquisition or divestiture of at least 75% of the shares. Investors like one-time dealmakers—at least in the short term. According to our sample, capital markets tend to buy into the story of a once-in-a-lifetime opportunity for acquirers. They are also appreciative when a company sheds a noncore asset that it more than likely held onto for too long. As a result, the initial capital market reaction is distinctly more positive for one-time dealmakers than for their more active counterparts. One-timers achieved higher CAR than portfolio masters across each five-year window from 1991 through 2015. The element of surprise becomes more visible when looking at the range between each category’s average positive and negative CAR on deal announcement. Favorably received deals by one-timers earn an average CAR of 12.1%, while deals raising doubts result in an average CAR of –6.5% on deal announcement. The spreads for strategic shifters (7.4% to –5.1%) and especially for portfolio masters (4.8% to –4.1%) are much narrower. Because portfolio masters and, to some extent, strategic shifters are better known quantities in an M&A context, investors expect them to engage in transactions and the assessments of their deals coalesce more quickly. How do they do it? The biggest difference between portfolio masters and less experienced M&A dealmakers is their insight into the associated deal risk. Given their experience and frequent use of M&A as a strategic tool, portfolio masters are much better at predicting deal outcomes than less experienced companies. On the buy side, they estimate synergies and postmerger integration (PMI) costs more accurately, and they deliver on their projections. When shedding an asset, they understand the complexities involved, and they assess the impact on the rest of the organization. They—and their investors—know what to expect 12 months after a deal is announced. Combining returns and volatility into a risk-adjusted performance measure (calculated as RTSR over the standard deviation of RTSR) demonstrates the significantly better performance of portfolio masters over strategic shifters and one-timers. Investors in portfolio masters enjoy the highest returns per “unit of risk”—11.2 for portfolio masters versus 9.3 and 5.9 for strategic shifters and one-timers, respectively. It’s a well-known truism that investors dislike diversification. For portfolio masters, however, this paradigm does not apply. We find only a marginal difference between portfolio masters that pursue a diversifying strategy and those that narrow their activities, either one year after the deal announcement or over an entire five-year time period. (See the exhibit below.) We define a company following a diversifying strategy as one that has, over a five-year period, done more than three M&A deals—either acquisitions outside of its home industry or divestments of operations within its core industry, as measured by the two-digit Standard Industrial Classification (SIC) code. How can this be? Investors are supposed to favor more focused companies because of their superior capital allocation and potential to unlock synergies from related businesses. In fact, portfolio masters do exactly what investors want companies to do. They systematically review their portfolios—asking with respect to each business or asset, are we currently investing our shareholders’ money in the most value-generating way possible? If the answer is no (which it often is), and there is a better opportunity beyond the current corporate borders, they use M&A as a strategic tool to seize it—and thereby improve their capital allocation. Since their decisions are well grounded in an objective strategic review, it is easy for them to argue that their actions favor their investors. Whether these companies decide to divest a former core asset, invest in a new technology or sector, or add an additional but synergetic pillar to their existing operations, investors have come to understand—and trust—that their decisions are made with value creation in mind and that management is good at identifying, acting on, and realizing the potential of all kinds of M&A opportunities. While portfolio masters earn higher one-year returns than their less experienced counterparts, this gap widens to an even greater margin in the long run. 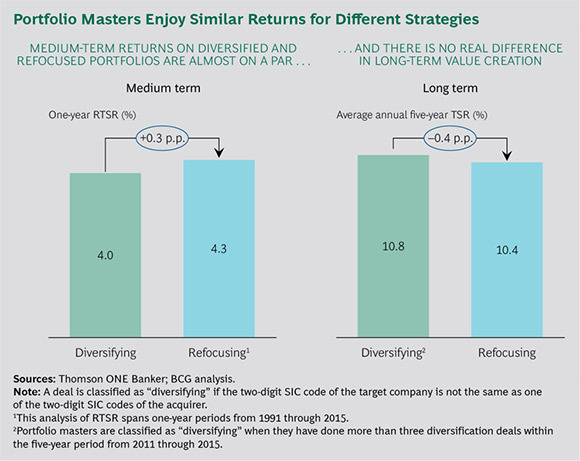 During the five years from 2011 through 2015, for example, portfolio masters’ average annual TSR of 10.5% is significantly higher than that of strategic shifters (7.9%) and one-timers (5.3%). (See Exhibit 3.) In other words, a shareholder that invested $10,000 in the average portfolio master in 2011 was $3,526 better off in 2016 than a shareholder that invested the same amount of capital in the average one-timer. In addition, portfolio masters experience lower long-term share price volatility than their less acquisitive peers, exposing shareholders to less risk even though they engage in multiple portfolio shifts that could be assumed to impair daily operations. The average TSR volatility of portfolio masters is 3.4 points lower than that of strategic shifters and 8.4 points lower than that of one-timers. It may seem counterintuitive, but the data is clear: the more frequent M&A activities of portfolio masters produce superior shareholder returns at lower risk in the medium and long term than those of less frequent acquirers. This begs the questions, explored elsewhere in this year’s M&A report, of how portfolio masters work their magic and whether companies that develop from one-timers into portfolio masters also see an increase in their returns. (See “How Portfolio Masters Make M&A Work for Shareholders,” BCG article, August 2016.) Or put another way, can deal-making neophytes learn to become M&A masters?